Di Indonesia tidak ada kanguru. Buku itu ada pada saya. Saya tidak ada uang kecil. 例えば，Abang saya ada tiga anak. について，Possessive ada is preceded by a noun phrase indicating possessor and is followed by a complement indicating the person/thing had. この James Neil Sneddon, INDONESIAN: A Comprehensive Grammar (2nd Edition, 2010), 「英語話者のためのインドネシア語文法の本」と最初に書いたが，Introduction (p.1) からもう少し補っておけば，This is a description of the Indonesian language for English-speaking teachers and learners and for any others interested in the language and its structures. 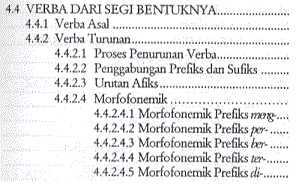 (...) It also differs from linguistic studies in that it does not always describe Indonesian grammar 'in its own right'.